Note: When the 6 month monitoring stage arrived for this line, just like other lines of this species, it had grown incredibly fast! On our monitoring dive we were unable to measure it, as it has outgrown our calipers (200mm)! The fragments have almost doubled in size in 3 months! 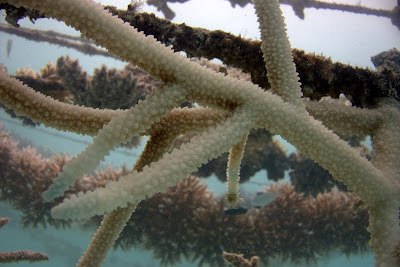 It appears immune system is compromised in the species in favour of fast growth though, and the fragments on this line were hit quite badly by a coral disease. Despite being infected by White Syndrome (a coral disease likely caused by bacteria) a few months ago, it has recovered well. Many of the fragments affected have suffered only partial mortality and are still growing. In April 2016, the sea surface temperature rose quite considerably causing a mass coral bleaching event. To learn about why this happened, you can visit our Coral Bleaching page. See below for the status of this line during the bleaching event. We will post more updates in the coming months. 2.5 year update: Unfortunately the El Nino killed this entire line. you can see from the photos at 2 years that it bleached badly, from which it could not recover. 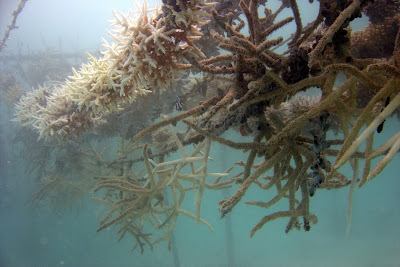 All of this species, both in the nursery and on the reef died. We just have a small patch remaining to us within our lagoon. We have since fragmented this in the hopes that the genetics contain some kind of resilience to the warming. We are sorry to report this, however the data collected will be valuable for our research. If you require more information or would like us to plant you another line, please email our project manager at deborah.burn@gili-lankanfushi.com. After 2 years of growth, we can see Acropora aspera is a fast grower! It grew so well, that it became heavy and hangs below the other lines, making it impossible to photograph from above. However, it was very susceptible to the bleaching during the El Nino in April/May. 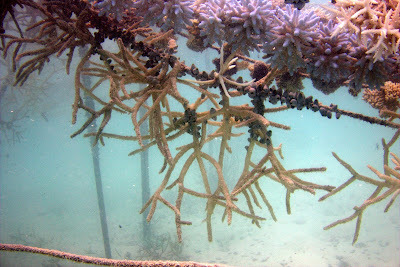 Here we can see the surrounding corals have bleached white, as well as the branches of line 017. Some mortality has since occurred, however this is still useful data for us to learn which species will proliferate in the coming years. If we zoom in, we can still the polyps are alive on this coral, and some brown colour is still present, which is a good sign. We will assess the full extent of damage in the coming month once the event is over. We can then see what percentage of this line survived, along with which species were most resilient. This will help us build a nursery of more resistant corals, which will eventually improve the resilience of our One Palm Island Reef transplantation zone!